Jeff Nielson writes that some US investors are contributing to trouble in the Eurozone financial system which has taken some off the spotlight away from the money printing by the Federal Reserve. Investors of US derivatives can make huge bets on sovereign debt which can influence these markets and undermine the solvency of governments. See the following post from The Street. When Ben Bernanke announced more money-printing with his $600 billion in quantitative easing, it highlighted two of the economic lies perpetuated by the U.S. government. First, it officially put to rest the fiction that the Federal Reserve had an "exit strategy" (other than simply more and more money-printing until the U.S. economy collapses). The second lie that was exposed was the supposed, eternal commitment of the U.S. to a "strong dollar." Understand that in Bernanke's own words, more QE was necessary to "increase inflation," and increasing inflation is identical to weakening the U.S. dollar, being merely the other side of the same "coin." With those illusions ripped away from the legions of market-chumps who continued to believe in U.S. propaganda, the U.S. dollar began another nose-dive. And within days of that collapse beginning, the U.S. propaganda-machine (with a helping hand from the UK) began another wave of Euro fear-mongering -- in what is clearly "déjà vu all over again" (see U.S. Economic Terrorism: The New Winning Trade ). Regular readers have already read this "script" before, almost exactly a year ago. 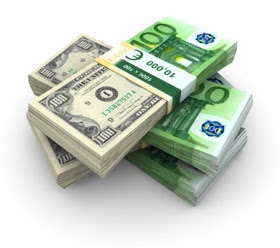 The U.S. dollar was plunging against all other currencies, when one morning the U.S. media announced there was a "Euro debt crisis." From that point, nine months of around-the-clock propaganda followed, "predicting" all manner of "defaults," economic collapses, and even the disintegration of the EU itself. Obviously it takes more than mere words to engage in economic terrorism, that's where the amoral psychopaths of Wall Street enter the picture. Using the "financial weapons of mass destruction" which Warren Buffet warned us about many years ago, Wall Street traders piled-into the extremely leveraged credit-default swap market -- and started placing massive bets against European solvency. Note that in the unregulated world of U.S. derivatives, players are allowed to make huge bets on sovereign debt, which severely influence those markets -- even though these bankers are not parties to the actual sovereign borrowing themselves. Furthermore, unlike any other kind of "gambling" in existence, merely placing very large bets against the solvency of European governments directly undermines their solvency. Because these Wall Street bets are part of global debt markets, merely piling onto one side of a bet strongly influences perceived risk -- and thus directly affects interest rates. In other words, the bigger the bets against (for example) Greek solvency, the higher that Greek borrowing costs surged. Obviously, a nation that was struggling to stay solvent when borrowing all its money at 3% is much closer to insolvency when those borrowing costs spike (almost overnight) to 6% - 8%. In other words, simply placing large enough "bets" against the solvency of any of these fragile economies becomes (literally) a self-fulfilling prophecy, not because the fundamentals of these economies have changed, but totally due to Wall Street leveraging massive bets against these governments. This is nothing less than the criminal manipulation of international debt markets. As a reminder, we already know that the credit default swap market is roughly $60 trillion in size -- equivalent to global GDP. When you intentionally leverage a market of that size against an economy the size of Greece (less than 0.1% as large as the global economy), this is nothing less than an "attack" on Greece's debt-markets, and an attempt to destroy Greece's economy. The only difference between the new attack, and the attack commenced one year ago, is that the primary focal point has shifted from Greece to Ireland. Other than that, this is an exact repeat of that one year-old script. While this represents nothing but a "winning trade" to Wall Street's economic terrorists, tens of millions of Europeans have already had their prosperity destroyed by these psychopaths, and apparently they intend to continue playing this game until the entire U.S. financial sector is "quarantined" from the rest of the global economy. It is in this respect that Wall Street bankers once again clearly demonstrate their psychopathic compulsions. Obviously, whether they actually "succeed" in destroying one or more of these economies, or not, what the Oligarchs are definitely "destroying" is another one of their own markets. Indeed, Wall Street is almost forcing draconian action by the EU as a whole: such as unilaterally repudiating all credit default swap contracts, and banning all U.S. financial institutions from participating in Euro debt markets. If such measures sound "unthinkable," compare that with how "unthinkable" it is to allow a small group of economic terrorists to go around destroying the economies of its friends. This post by Jeff Nielson has been republished from The Street, an investment news and analysis site.